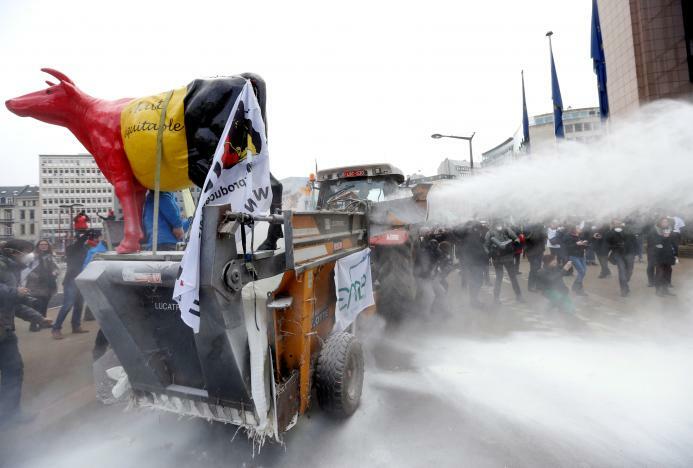 In a move to protest against dairy market overcapacity, dairy farmers sprayed a tonne of milk powder onto a building used by EU leaders for summits in Brussels on Monday. The European Union has bought large quantities of skimmed milk powder to stabilise the market but said in November it would start disposing of some of it after prices had improved. Hundreds of farmers protesting in front of the European Council’s Justus Lipsius building, where EU governments regularly meet, said they feared that putting the milk powder back onto the market would depress prices in the EU and abroad. Protesters used farm machinery to cover the building and nearby police officers in a thick coat of the sticky, white powder, Reuters reported.